When journalist Liam “Mick” Murphy lies to the chief of police in order to get a story, he uncovers a conspiracy to smuggle a cheap, lethal cocaine-based drug through Key West. Before long, local authorities, federal agents and drug cartel hit men are looking for Murphy because of what they think he knows. With help from an eclectic group of friends, including an old black[ops acquaintance from Central America, Murphy sets out to prove who’s behind the smuggling plot and distance himself from the violence that has spawned havoc on the island. Soon, Key West starts to look like the Wild West as bodies are scattered in the streets and businesses get shot up. Murphy and his ragtag army do their best to survive and strike back, but stopping the drug delivery becomes impossible when the smugglers outgun Murphy’s crew in a grisly battle on the water. Back in Key West, Murphy escapes more mayhem and confronts the conspirators, with devastating results. Liam “Mick” Murphy had a career in journalism that took him all over the world. After a devastating event cause him to quit full time reporting, he semi retired to the Florida Keys. There he works as a free lance writer and journalist for hire. A phone call from a friend causes him to be caught at the sight of that friend’s demise. He knows he shouldn’t lie to the cops, he knows that it will only come back to bite him in the rear. But he does it anyway because he also knows that his friend’s death is not a suicide. Within days of his friend Jay Bruels’ death he is caught up in what turns out to be a very nasty murder and conspiracy operation by elected local officials, bought Federal Agents and a South American Drug cartel. These people were using the Keys as their entry point to bring their drugs into the country, and now they also wanted to bring in an extremely cheap and extremely deadly new drug. Mick and his on again off again girl friend Tita Toledo (a very sought after attorney) are going to have their lives and their relationship stretched well past the breaking point. With the help of a rag tag group of friends, (who by some coincidence are all agents, former agents) plan and run their own investigation into the murders and drugs. There will be shoot outs, high speed boat chases, and well… You’ll just have to read the book to find out who does what to whom, and who wins out at the end. This was my first taste of a Mad Mick Murphy book and I love it. Mick reminds me a little of Travis McGee what with the way he gets involved in things and helping friends. I’m looking forward to reading the rest of this series for as long as the author offers stories to read. FTC Full Disclosure: I received this book from the author who only asked for a fair and honest review. I’ve read and reviewed this one too, Nora. He’s a great fast-action writer who can create vivid characters and setting. I read this book, too, and I would concur with the reviewer. 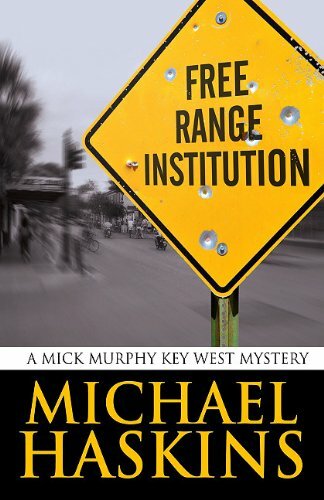 I would also add that there are several secondary characters in this novel that recur in Michael Haskins’ other novels to bind Mick Murphy more tightly into the Key West setting. The reader will feel right at home with this series.